The Easy Rise Cushion Is Lightweight and portable. Utilising the users own body weight the Easy Rise Cushion is an easy to use method of helping a user raise from their chair. 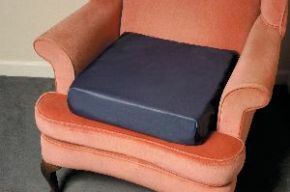 Specially layered foam gives the cushion a natural spring which gently raises the user as they lean forward to a standing position. Raises the seat height by 100mm (4"). Lightweight, ideal for portability. 450mm x 450mm x 100mm (18" x 18" x 4"). I bought this for my mum who has osteoarthritis (and is now in her late 80's) so finds getting in and out of chairs quite difficult. She absolutely loved it. She used it the whole day I was there and said she had less back pain than she usually would have too. A great product. Only other comment, it's a shame they don't come in other colours! Great product for armchair use. Firm, and gives a bit of a push off the chair. Would suggest a similar, slightly smaller product for dining chair use. Nice quality cushion that I am sure wont flatten like cheaper versions. It makes it much easier for me to get up off my armchair.